A contaminated batch of the drug is said to be circulating in the Cavan/Louth/Meath area. 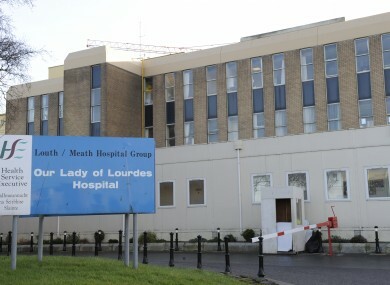 Our Lady of Lourdes Hospital in Drogheda, where the two women remain in critical condition. THE HSE HAS issued an alert to service users and community and voluntary groups working with drug users about a contaminated batch of cannabis which appears to be circulating in the Cavan/Louth/Meath area. This follows news of two women who were hospitalised in Drogheda and required intensive care after using the drug. Today the HSE said that reports have been received that this batch has “unusual side effects leading to admission to intensive care”. A garda spokesperson tole TheJournal.ie that the two women had similar symptoms and that “the same intoxicants” were found in their systems. They said they are both in critical condition at Our Lady of Lourdes Hospital Drogheda and that the investigation into the incident is ongoing. It is important that anyone displaying negative side effects following the use of drugs seek medical help immediately. The HSE renminded the public that taking drugs” carries serious health risks”. Email “HSE warns of contaminated cannabis as two women remain in critical condition”. Feedback on “HSE warns of contaminated cannabis as two women remain in critical condition”.